Ebode stands for electronic home and comes from the word abode. As one of Europe’s leading suppliers of custom AV installation, building automation and lighting control solutions, BMB electronics was confronted with a demand from end users for home automation, entertainment and security. In 2009, BMB electronics developed and introduced consumer electronic products for the electronic home. Based on successful installations of products like infra-red extenders and wireless audio / video products, the Ebode brand was created and a retail concept was developed with comfort, affordability, use of the latest technology and ease of installation as the hallmarks. Ebode is focussed on wireless consumer electronics that provide easy control over audio and video hardware and signals, appliances, heating, motorized shutters etc. available from anywhere at your fingertips. To control your electronic environment Ebode offers high quality products that are being tested in our lab where we focus on high quality, user friendliness, affordability, modern technology and high turnover products with added value that meet the expectations and opportunities of today and the future. Shortly after introducing the first IP Camera, Ebode is celebrating the launch of another new product group: Bluetooth Sound. The first product in this group is the wireless Bluetooth Speaker. Since its establishment in 2009, Ebode electronics has proven to be a serious player in the competitive retail market. In May the innovative Bluetooth Speaker arrived at the warehouse. This small speaker has a surprisingly good sound and bass. 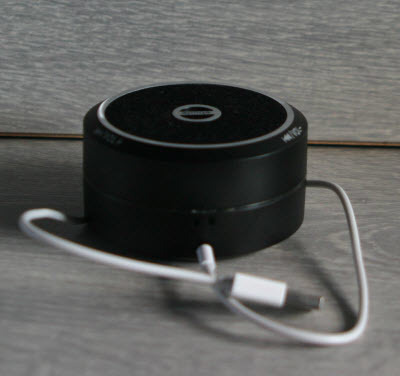 The ebode Bluetooth Speaker can be used to share music on a smartphone, tablet or laptop wirelessly. As the ebode Bluetooth Speaker is small you can enjoy your favourite songs any place, anytime, anywhere: at parties, family events, festivals or while travelling. 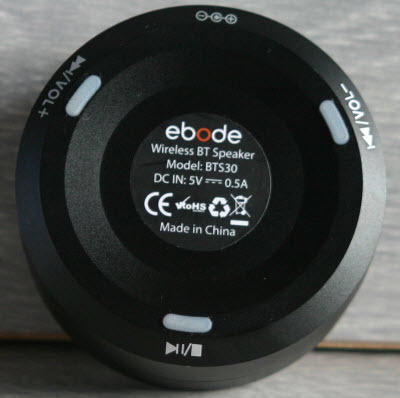 Pairing your Bluetooth device with the ebode Bluetooth Speaker is quick and easy. The actual speaker with the controls for play/pause, skip/volume up and rewind/volume down. Well it works like a charm. You can pause, skip to next track, go back and adjust volume. We tested the maximum distance and found it to be about 8 meters (26 feet). How good is the sound you may ask? It’s really not bad for such a small device. Not that much bass but the highs were really good. I have to say, setting the volume too high isn't something I’d recommend. 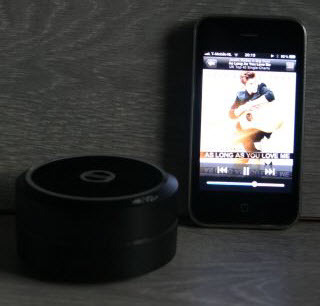 Although, it’s nice to have a wireless speaker, don't expect too much from the sound. It’s good enough for my daughters to use in their bedrooms, but I’m wondering how long it will be before they want the laptop back to play music. Ebode delivered a fun gadget. Searching online for pricing I found a price of € 49, which seems a bit high. The BTR30 is a small device with typical buttons for audio playback control. The device is powered via a supplied USB cable and domestic and in-car power supplies. A 3.5mm (1/8”) audio cable, 3.5mm to RCA female and a pair of ear buds are also included. A multi-lingual user guide is also included. 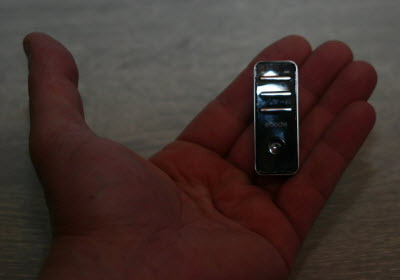 The BT30 is about the size of a finger. So let's give some juice to this mini device. As it has a rechargeable battery, we need to charge it first. Connect the receiver with the supplied usb charging cable. The first charge will take 2 to 3 hours. The LED turns from red to blue when this process is complete. To turn the Bluetooth receiver on, press the On/Off button until a beep is heard and the LED flashes blue. Connecting to an amplifier is done by plugging one end of the audio cable to the device and the other to the amplifier/receiver using rhe 3.5mm to 3.5mm cable or the 3.5mm to RCA and a standard RCA patch cable. 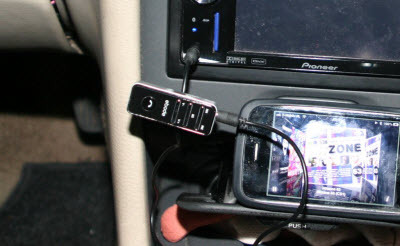 The device can also be connected to car stereo equipped with an auxiliary input jack. Time to pair the Bluetooth device. 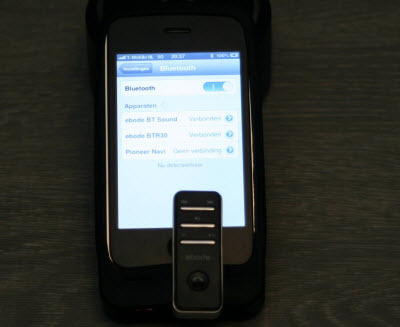 Searching the Bluetooth devices on my on my iPhone shows the BTR30 after a few seconds. I found a much better way to use this personally, as I ride motorcycles and for leisure, but could never really control my music while riding. I was very pleased to have a much smaller device to control my music. I just plug in a set of head phones and I'm ready to go on two wheels. Now I have 2 Ebodes on my old trusty iPhone 3GS (soon to be changed to the iPhone 5). Both working like a charm. You can pause, skip to the next track, go back to the previous track and adjust volume. We tested the maximum range of the device, and were able to control music from a distance of 12 meters (39 feet) on the BTR30. Ebode delivered a useful gadget. That's for sure. Online pricing is €39.99 which seems reasonable for such a device.